Here we are concerned with the various types of trout, Forelle. There is a bit of confusion with the vocabulary. Sometimes different names are given. Trout is the common name given to a number of species of freshwater fish belonging to the Salmonidae family. Plecoglossus altivelis, is an amphidromous fish, the only species in the genus Plecoglossus and in family Plecoglossidae. It is a relative of the smelts and is placed in the order Osmeriformes. Native to the Palearctic ecozone, it occurs in rivers, lakes, and coastal waters of western Hokkaidō in Japan southward to the Korean Peninsula, China, and Taiwan. They are rather strong and can survive the winter season. Japanese trout in the genus of Salvelinus.
. . . CLICK here for Photos : whitespotted char ! kawamasu 川鱒 (かわます) "river trout"
amemasu あめ鱒（あめます）/ 雨鱒 "rain trout"
Amemasu is the Japanese name for the white-spotted char (Salvelinus leucomaenis leucomaenis), a species of trout which is found in Northeast Asia. They are a popular target of game fishing and are also raised in fisheries. Amemasu spend most of their lives in the water, away from humans. They are found mostly in rivers and streams, but seagoing varieties exist as well. They are more common in Hokkaido, the northern parts of Honshu, and along the Sea of Japan—however legends of amemasu are occasionally found in the southern parts of Japan as well. They feed on whatever they can eat—from plankton to insects, to fish and any other aquatic lifeforms they can fit into their mouths. Yōkai amemasu can grow to colossal sizes, sometimes spanning an entire lake from head to tail. These giant amemasu also occasionally thrash and sink ships, devouring any poor souls who happened to be on the ship. In Ainu folklore, the wild thrashing of giant amemasu is believed to be what causes earthquakes—much like giant catfish are thought to cause earthquakes in the rest of Japan. Amemasu can transform into human shape and walk about on land. They usually take the form of young, beautiful women in order to seduce young men. Shape-changed amemasu can be identified by their skin, which feels cold and clammy like that of a fish. A number of lakes in Hokkaido are believed to be the home of giant amemasu. According to Ainu folklore, these amemasu are thought to be the guardian deities of their respective lakes. Lake Mashū is home to an amemasu the size of a whale. Lake Shikotsu contains an amemasu so large that its head touches one end of the lake and its tail touches the other. 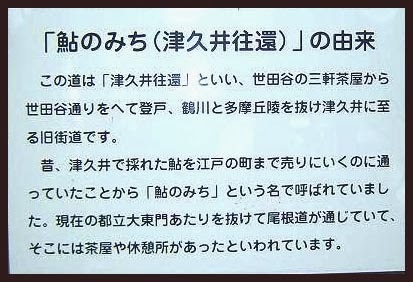 Wakayama Prefecture tells of a mysterious whirlpool that appeared in a deep pond. A giant amemasu lived in the pond. Every spring, she would emerge from the pond in the form of a beautiful woman. For two or three days she would catch young men and take them away—where to nobody knows, but they were never seen again. The only way to know that it was a fish and not a woman was from her cold, clammy skin. One day, a cormorant dove into the pond to go hunting. The giant amemasu swallowed the bird in a single gulp. However, after a short time, the amemasu’s body floated up to the surface of the pond, dead. The cormorant burst out of its stomach. A shrine was built at that spot to honor Konpira-san, which still stands today. A hawk who lived on top of the mountain stood on the rocks of the lakeside, looking out for trout. When he wanted to pull one out, the trout was fighting vigorously and eventually both animals died. landlocked salmon "among fallen leaves"
Bei der Meerforelle – frz. truite de mer – handelt es sich um die Wanderform, die sich aus standorttreuen Bachforellenbeständen entwickelt. Bei Bach-, See- und Meerforellen handelt es sich somit nicht um verschiedene Arten, sondern alle drei gehören derselben Familie an. Einzig die verschiedenen Lebensräme und -formen bedingen die Unterschiede in Aussehen, Wachstum und Verhalten. Ihren Namen erhielt die Regenbogenforelle (frz. truite arc-en-ciel – it. trota arcobaleno) aufgrund des in allen Regenbogenfarben schillernden, breiten, rötlichen Seitenbandes. Die Regenbogenforelle ist eine Kreuzung einer Wanderform und einer reinen Süßwasserform, unserer Bachforelle vergleichbar. Die Bachforelle ist einheimisch und die Regenbogenforelle vor ungefaehr zweihundert Jahren aus Amerika zu uns gekommen. Bachforellen, die uebrigens nicht in einem Bach leben muessen, sondern auf sehr sauberes und sauerstoffreiches Wasser angewiesen sind, haben an den Flanken rote Punkte und je nach Untergrund sind sie falb, braun oder dunkelgrau. Regenbogenforellen werden haeufiger angeboten, da sie nicht ganz so anspruchsvoll an die Wasserqualitaet sind und schnelleren Wuchs haben. Man erkennt sie, wie der Name schon ahnen laesst, an ihrer schillernden Zeichnung, die stark an einen Regenbogen erinnert. Lachsforellen sind Regenbogenforellen aus Fischzuchten, das Fleich meist rosa oder rot. 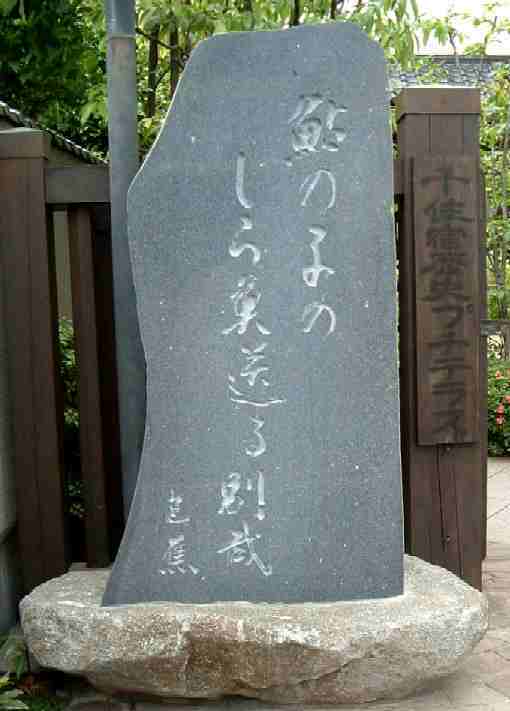 and uranai 占 divination on the right side. So there is no wonder we also have a ritual of divination with this fish! On the first Sunday in July. 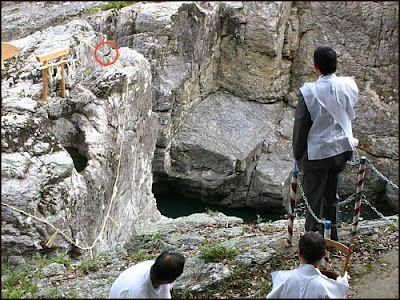 12 elected people throw 12 trout over the small river into a round rock cavity of about 50 cm, one trout for each month to divine the outcome of year. They stand on a rock about 7 meter high above the cavity. If they hit it straight, Great Luck and a flag is waved. If they do not hit, it is still Middle Good Luck 中吉 and nothing bad should happen. Of course a lot of grilled trout is also served at this festival. also called Tsukui Ookan 津久井往還 Road of Tsukui, a town in the North-West of Kanagawa prefecture. Trout that were fished in Kutsui had to be transported to Edo for consumption as fast as possible. They were carried to the tea shop Sangenjaya 三軒茶屋 in Setagaya 世田谷.
. Sangenjaya 三軒茶屋 Sangen-jaya, "three tea stalls" . The fish were put in buckets and the carriers stopped ever so often to put fresh water into the bucket to keep the fish happy and alive. There is also a "Trout Road" near Hachioji into Edo. and say good bye . . . The whitefish are the first to go upstream to spawn, the ayu follow them one month later. Basho and Sora are ready to depart for "Oku no Hosomichi" and he has to leave his young disciples (ayu no ko) behind at Senju. This hokku has the cut marker KANA at the end of line 3. Ai or ayu, river trout, Plecoglossus altivelis. oem by Haruzono Shizuo. 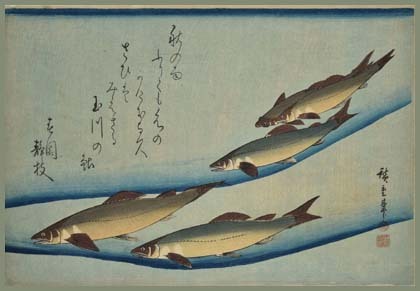 From the first set of fish prints published by Eijudo, c 1832-4. This first series was issued privately for a poetry group ( probably the Shingyoku Circle ) with judges’ names and extra poems. These prints are of the utmost rarity as probably only enough for the Circle were printed and they never come onto the market. Due to their popularity this first series was published commercially and a second set was commissioned. The most sought after print in the series and probably the first to be designed. Thank you for interest informations. The cormorants from Nagaragawa fish for ayu sweetfish, and the humans eat them afterwards. The people of Edo were very fond of fortune telling of all kinds. Once two brothers were thowing their fishing nets out along the river of 三沢村 Misawa village. They caught a lot of ayu 鮎 trout. To make sure the Tengu would not be jealous of their catch, they opened three fish, cleaned them and put them on the lid of the fish trap. Once the Tengu was not pleased and a 火の玉 huge ball of fire came down on their boat. They were afraid and rushed home.
. kawauso 獺魚 / カワウソ river otter .